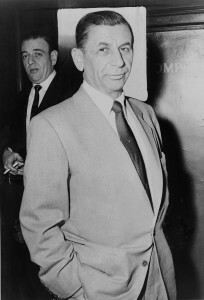 Born Maier Suchowljansky in Grodno, Russia, Lansky immigrated with his parents to New York’s Jewish slum, the Lower East Side, where he and pal Bugsy Siegel formed a profitable street gang. With the acumen of a skilled entrepreneur and the ruthlessness of a criminal, Lansky built a powerful and multifaceted crime syndicate that became the model for organized crime in America. Grown wealthy, he bankrolled other criminals in a variety of illegal enterprises, but his specialty was always gambling. His gambling empire stretched from pre- Castro Cuba, the Bahamas, and Florida, to Las Vegas, a city his money was largely responsible for developing after World War II.